Imara Studios, accessed via Twitter. This image arrested me today. An Infantryman's infant. 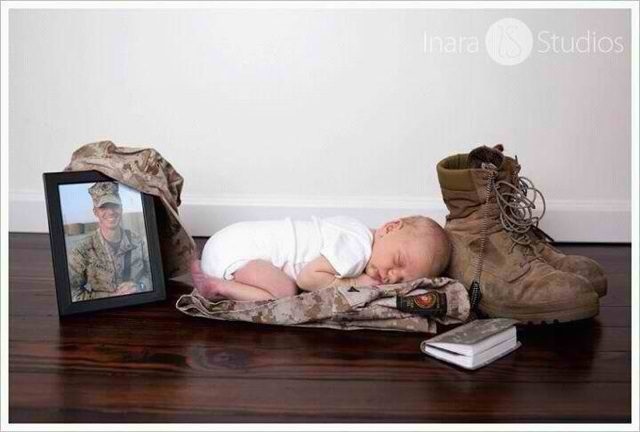 A child who will not long be kept warm by his father's empty uniform. Many of the men and women who have given their lives in service to our country were fathers and mothers. Each and every were somebody's child. This same image could serve as a haunting forecast of a future casualty in a future conflict. Our son, Ezra, will be 4 months old on Sunday. I cannot fathom how quickly-lived will be the time from today to his eligibility for enlistment. The passion of the Son has shown the Father's heart towards the estranged children of God. The presence of the Spirit turns the grieving heart into a garden for a grace as yet unseen. The power of the Father brings all things to stillness and ensures death will not enjoy the final exaltation. In other Memorial Day reflections, Relevantmagazine.com has a thoughtful piece written by a "soldier turned pacifist," on the tension between loyalty to God and Country. I invite you to leave a comment below in honor of those who have given their lives for our freedom.